Grosvenor Pacific will be a 40-storey condo tower designed by Montreal’s Maxime Frappier. Grosvenor has been building in and around Vancouver for 60-plus years, but their public profile has been near invisible. That's about to change. The British developer is building its first residential tower in downtown Vancouver, on Hornby at Pacific. The Grosvenor Pacific will be a 40-storey condo tower designed by Montreal's Maxime Frappier, in partnership with IBI Group. The company purchased the Hornby Street property, which includes the bright yellow heritage Leslie House, former home to Il Giardino Italian restaurant, about three years ago. It is one of about a dozen projects that the usually low-profile developer has under way in cities throughout North America. That's the greatest level of activity that Grosvenor Americas chief executive Andrew Bibby has seen in his more than 30 years with the company. Mr. Bibby, seated in a boardroom inside the Grosvenor office, with a Douglas Coupland artwork hanging nearby, explains that they are a risk-averse company that likes to keep it simple. They stick to what they know as one of the world's oldest property developers and managers. "We are not doing more in Vancouver proportionately than anywhere else," says Mr. Bibby, who grew up in Dunbar and attended St. George's private school. "We grow as a whole. We are quite particular about the markets. They are all nice cities – all have positive attributes, usually well-educated [demographic], good infrastructure and good amenities, generally. So we choose cities for that reason, and then we go in and change cities. We are a small actor given the size of the city, but over time, it's significant. So you can make a difference." The company's first project outside of Britain was Annacis Island, a former farm on an island in the middle of the Fraser River that became Canada's first industrial park, in 1953. As pioneers in leasehold properties – which means they retain ownership but sell long-term leases – Grosvenor still owns and rents out about one-third of the island. They'd built office space, such as the Grosvenor building for their Vancouver offices on Alberni, and other low-profile projects around the Lower Mainland. But a focus on residential development in Vancouver is a relatively new move for the 340-year-old Grosvenor Group, a company that formed in England in 1677. The owner is the young Seventh Duke of Westminster, Hugh Grosvenor – the wealthiest person under 30 in the world. Their move into major residential projects means greater public awareness of a developer that's kept quiet over the decades. Publicity in Vancouver is rare for the company, aside from the time that the Sixth Duke of Westminster, Gerald Grosvenor, donated artist Liz Magor's well-recognized Lightshed public-art sculpture, displayed near a pathway in Coal Harbour. A model sits in the boardroom, among several other art pieces. The privately owned company's most prestigious real estate asset is the development that launched it all, in the 1720s – farmland that became London's Mayfair and Belgravia neighbourhoods. They still own about 300 acres in London, including leasehold land on which the American Embassy sits as well as Canada's former diplomatic mansion, Macdonald House, both on Grosvenor Square. After the Second World War, the family decided it was best to diversify elsewhere, which is why they purchased Annacis Island. They might have also been inspired by Britain's Guinness family, who'd purchased the British Properties a couple of decades before, Mr. Bibby says. Today, they have North American offices in Vancouver, Calgary, San Francisco and Washington. 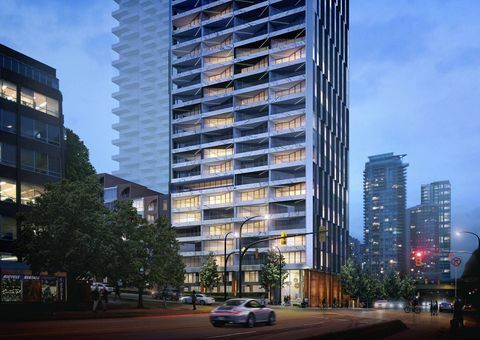 Because of downtown Vancouver property values, the new Hornby tower won't fall into the category of affordable. High-end condos are currently priced at around $2,000 per square foot. The design, architect Maxime Frappier says, will take into consideration Bjarke Ingels's twisty Vancouver House on nearby Howe Street. "We have one big gesture there, so we wanted to be a bit more quiet," Mr. Frappier says. "Because of the contrast of materials, the tower will catch the eye – you will see it from far away, without being too spectacular. It's like Louboutin shoes – the underside is red. You don't have to be too extravagant." And the tower won't have the usual podium with retail at its base, which can create the look of a cake, Mr. Frappier says. Instead, it will reference an original row of houses at street level, which is far more pedestrian friendly, he says. He wants to integrate the design with the history of the neighbourhood. The Leslie house is one of the city's oldest, built in the 1880s. It will be restored and relocated to the southeast corner of the site and used for commercial space. "I am not designing for the East Coast and dropping it on the site in Vancouver," Mr. Frappier says. Because the company likes to do business in markets long-term, they aim to please – and to avoid conflicts. "We pride ourselves on being very capable, or adept, at both dealing with elected representatives and the community itself," Mr. Bibby says, referring to their drawn-out public consultations on Northshore projects. Their mixed-use award-winning Rise project on Cambie managed an unlikely combination of big-box retail with live/work rental units and a large outdoor rooftop green space. City hall had pushed for the residential component, Mr. Bibby says. The company decided to go with a rental project because they could maintain control of a property in a changing neighbourhood. "Long term, when SkyTrain comes through on Broadway, that will be one of the most important intersections in Vancouver, so we wanted to keep control of that because it could be redeveloped in the future, or modified, anyway," he says. About a decade ago, the company started assembling properties for Grosvenor Ambleside in West Vancouver, which launched three years ago. Prices for units in the first phase started at around $1 million. "Probably the most profitable thing to have been done would be build a couple of towers on there," Mr. Bibby says. "With a small point tower, you get lots of views, and so on, but we went to the community and we were told they wanted something lower profile. It's a beautiful building, but arguably not the most profitable. But it's what the residents wanted. I'm not saying it was a cakewalk, because it wasn't. It took a long time to assemble the land. We started that land assembly in 2003, and we are just finishing it now." James Patillo, managing director, development, says if anything, the hot Vancouver market has just made them more cautious. He never saw the market reaching the peak it did since they purchased the Il Giardino property. "We've certainly seen the ups and downs of the economy and been through many recessions. We want to be prepared to weather those. "We remain pretty optimistic, but the danger signs are there," he says. "[The market] has been moving at an unsustainable pace – I don't think anybody would deny that. We are optimistic that there is not a crash coming, but potentially, [it could be] a slowdown, a moderating of the market, let's call it, which I think would be healthy. As a result, we are being a little more cautious these days about how we look at future acquisitions and the amount of activity we do at this time. "I wouldn't go so far as to say it's a bubble. I would like it to cool off a little bit. There are danger signs there, but it doesn't feel quite yet like a bubble. But if it keeps going at the rate it is, I might change my tune." More than 60 per cent of the Pacific will be two bedrooms or more. "Absolutely, we would keep it local," Mr. Patillo says. "Of course you are not going to control who finds you in that local market, but certainly our focus is on the local resident." There are tools available to the developer, to safeguard against speculation, he says. "We don't want to be fuelling the speculation that goes on in this market. There are little things, like limit the number of buyers that a realtor can bring in, when you see realtors trying to bring groups of buyers in with them. And also limit the number of units that an individual can buy because that smells like speculation. And the third thing is we prohibit assignments, unless there are extenuating circumstances. But we do have a policy about that. And by virtue of the design we have for larger units, I think that helps as well." Editor's Note: The original print and online editions of this story incorrectly stated that Grosvenor owned Canada House. In fact, they are leaseholders for Canada's former diplomatic mansion, Macdonald House, on Grosvenor Square. This online version has been corrected.